"This is the recipe that my husband's grandmother made for her family, my mother-in-law made for hers, and I have inherited the fun of making this bread for mine. We particularly like this fresh out of the oven, and then eat it daily for breakfast. My father-in-law at 86 years old bragged about never having eaten a slice of 'store bought bread.'" Dissolve yeast and 1 teaspoon sugar in 1/2 cup warm water. Boil one medium peeled potato in 2 cups water with 1 teaspoon salt. Mash the potato in a medium bowl, while reserving the water. Combine the mashed potato, potato water, 1/3 cup of sugar, shortening or oil, 1 tablespoon salt, and milk in a large bowl. Make sure the milk mixture is warm, and add the yeast. Stir in 15 cups of whole wheat flour. Turn dough out onto a lightly floured surface. Knead for about 10 minutes. Place in greased bowl, and turn to coat the surface. Cover with a damp cloth, and allow to rise until doubled. Rising time will be about 1 1/2 hours. Punch down, and knead again for 3 minutes. Place back in bowl, and allow to rise again until doubled. The second rising period should be about 1 hour. Punch down. Form 4 loaves, and place into 9 x 5 inch greased bread pans. Let dough rise again for 30 - 60 minutes. Bake at 325 degrees F (165 degrees C) for 1 hour. See how to make a delicious whole-wheat version of classic ciabatta bread. I can see why this is a family favorite! We love it. I needed much more flour and ended up with 8 loaves. Was this my mistake? This was good bread, just not what I wanted on the day that I made it. Be warned that you need a huge bowl to allow this dough to rise. It overflowed the largest bowl in my house. What a pleasant surprise. 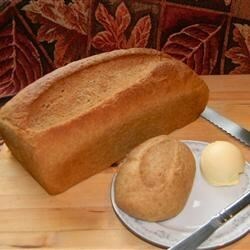 I didn't know homemade 100% whole wheat bread could be so light and tender. This one will be a regular around our house. It's not fast; but this is an excellant recipe. If you bake more bread than you buy, it's worth a try.